Takings from upstream oil and gas projects, whether they are small scale or big ticket ones, ultimately determine their profitability – the stuff that shareholders, venture sponsors and governments alike have a keen interest in. It is why oil and gas companies, both state or privately held, deploy an army of petroleum economists to offer conjecture or calculated projections on what the final fiscal share of such ventures might be. In this complex arena, both budding petroleum economists and established ones could do with all the help they can get. 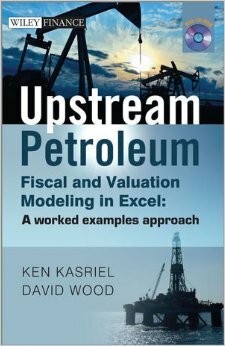 Industry veterans Ken Kasriel and David Wood’s book Upstream Petroleum: Fiscal and Valuation Modeling in Excel (published by Wiley Finance) goes a long way towards doing just that, and quite comprehensively too. In a volume of 370 pages, with eight detailed chapters split into sequential sub-sections, the authors offer one of the most detailed subjective discussions and guidance on fiscal modeling that is available on the wider market at the moment in the Oilholic's opinion. The treatment of fiscal systems, understanding and ultimately tackling the complexities involved is solid, predicated on their own views and experience of understanding the tangible value of upstream projects before, during and when they ultimately come onstream, and what the takings would be. Kasriel and Wood have also included five appendices and a CD-ROM (in the hardcover version) to take the educational experience further, and accompanying the main text of the title are over 400 pages of supplementary PDF files and some 120-plus Excel files, with an introduction to risk modeling. What is particularly impressive is the authors’ painstaking effort in cutting through industry jargon, putting across their pointers in plain English for both entry-level professionals and experienced practitioners. Furthermore, the sequential format of the book makes it real easy for the latter lot to jump in to a section for quick reference or for a subject specific refresher. Generic treatment of taxation, royalties, bonuses, depreciation, profit sharing mechanics, incentives, ringfencing, and much more, including decommissioning finance, are all there and should withstand the passage of time as both authors have called their combined 48 years of experience in the industry into play, to conjure up a reasonably timeless discussion on various issues. Above everything else, Kasriel and Wood’s conversational style makes this book a very purposeful, handy guide on a subject that is vast. The Oilholic is happy to recommend it to fellow analysts, (aspiring, new and established) petroleum economists, policymakers, industry professionals, corporate sponsors and oil and gas project finance executives. © Gaurav Sharma 2015. © Photo: Front Cover – Upstream Petroleum: Fiscal and Valuation Modeling in Excel © Wiley Publishers, March, 2015.